New Revolutionary Breakthrough Technology Makes ISPG The Fastest And Easiest Way To Build A Lucrative List Of Subscribers. 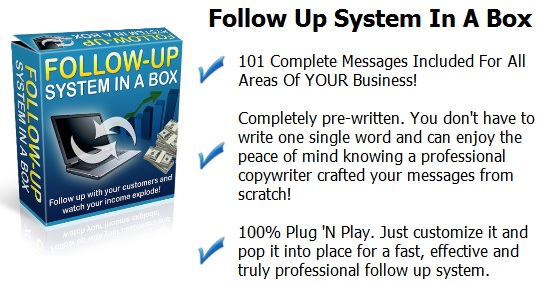 Try ISPG For Free And See This Amazing Automatic List building System For Yourself. So, How Do You Build A Money-Making List Simple. 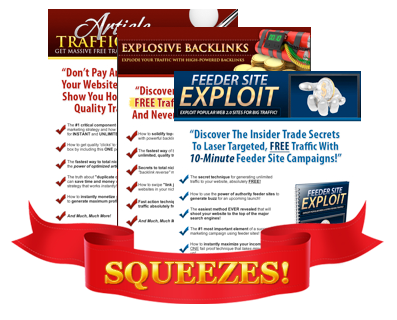 You have to run each visitor to your website through a compelling squeeze page that bribes them to trade their email address for a valuable FREE gift. If your squeeze page is professionally designed, written with compelling copy and offers a truly valuable incentive for signing up, it will rack up email addresses like crazy. And that is where Instant Squeeze Page Generator comes in. Professional Graphics Are Yours For the Choosing! Designing graphics that rock is time consuming even if you have the talent, and let's face it, most of us don't. And today, if your site doesn't have laser sharp bold graphics, it's not going to get their attention. Instant Squeeze Page Generator just cured all your graphics headaches. You choose from dozens of logos, buttons, headers and attention grabbers and electrify your squeeze page. But something is still missing, isn't it? Because of the vast proliferation of Spam, people guard their email addresses like Fort Knox. To get that opt-in, you are going to have to offer them something fresh, something that has high perceived value, and something they can get immediately. If you miss any of those ingredients, your conversion rates will plummet. So, you can take a few weeks and design a nice product to entice your visitors, or you can take the easy way out. Let Instant Squeeze Page Generator take care of it for you. That's right! You have access to smokin' hot products that you can offer your opt-ins for FREE! We'll Host the Products and Instantly Deliver Them For You! This is a great product that even I can use. I've had trouble using some other page builders, but this one is easy. I just pick out the template and click what I want. If you've ever setup a secure digital delivery system, you know what a pain it can be. And each site you create, you have to do it all over again. Not any more! Instant Squeeze Page Generator takes care of all the digital delivery details so you don't have to. Just choose the product you want and it takes care of the rest. As your opt-ins sign up, the product is delivered to their email address at the speed of light. Robert, What's The Catch Because There Is No Way I Get All This For FREE? 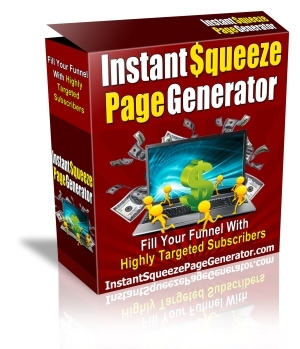 Instant Squeeze Page Generator is 100% FREE! Honest, there is no catch. You get the entire package... everything I described above, for zip, zero, nada! Point & Click Wizard - Creating these squeeze pages can't be made any easier. You point... you click... you are done! You don't have to know HTML, PHP, or anything more complicated than operating a web browser to design high-performing squeeze pages. High-Converting Templates - The templates have been designed and time-tested by professional marketers so you won't fumble around and make any rookie mistakes. The layouts are simply, what works today! Bold Original Graphics - Choose from dozens of professionally designed graphics to make your squeeze page Pop! Free Enticing Products - Forget spending your valuable time and effort developing the high-quality products you have to give away to get opt-ins. Just choose from a wide array of professionally developed & formatted products loaded with valuable information, and you are done! Free Digital Product Hosting & Delivery - All the hassles and worries of setting up and maintaining digital product delivery are handled for you. You don't have to buy expensive software or hosting, just pick the product and Instant Squeeze Page Generator takes care of the rest. It's FREE! The Choice Really Is a No-Brainer, Isn't It? There is no way you can lose on this one, is there? Actually, there is only one way. If you choose not to sign up... You lose time. You lose effort and most importantly you lose money. Everyday you delay is costing you money and keeping you in the losing category of the two types of marketers. Cross on over to the winners and start building a lasting business. Build a business that will continue to grow day by day. 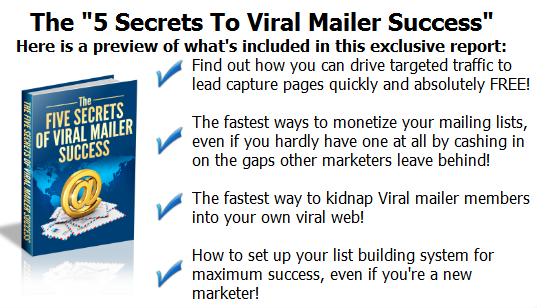 One that will produce more income each month as you build your list of op-ins. And as your list grows each month, your income grows each month! 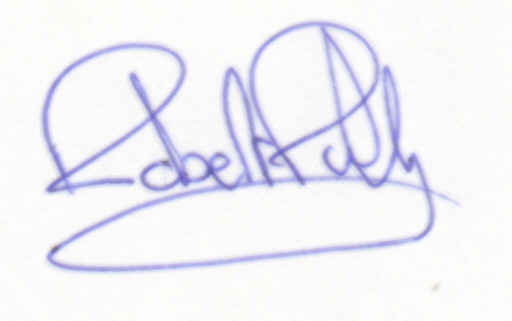 I just wanted to send Robert a public thank you. I have been farting around on the internet trying to make money for a couple of years now and until recently I have not done very well. Everybody always says build your list, build your list, build your list! I was not sure how to make a lead capture page and it was driving me crazy. Just about the time that I was trying to build my own page on my .ws domain I found Roberts Instant Squeeze Page Generator. I loved it and I had my first page up and collecting emails in about 30 minutes. It only took that long because it was my first time using it. Now, I can set one up in about 15 minutes. Thanks a truckload Robert! Yes, Robert, there is no way I'm passing this up! Instant Squeeze Page Generator is 100% Free! There aren't any catches! I'm getting everything you told me about for no money, ever. Point & Click Wizard - The Wizard guides me step-by-step through the entire design process to make my life so easy. Free Templates - I'm getting proven templates pulled from the trenches for me to use any way I like. Free Professional Graphics - Your graphic artists have designed me an array of images and graphics to choose from, to my heart's content. Free Enticement Products - Product developers have laboured to create highly-desirable products to me to give away to my opt-ins for free. Free Product Delivery - I don't even have to hassle with product delivery because you are going to take care of that for me too as part of my free membership. On that basis, the only move I see is to click the button below and join Instant Squeeze Page Generator for FREE! If you aren't in the winning category and begin building a list that will bring you massive income for years to come, have you decided to switch to the winning team yet? If you already are in the winning category are you are building your list with squeeze pages, have you decided to simplify your life by joining Instant Squeeze Page Generator? Wherever you currently are, it's obvious where you should be isn't it? You are risking nothing! It doesn't cost you one red cent to join so you are out of excuses. Would you like to start making an income that increases monthly? Would you like to live the life of a full-time Internet marketer. The sooner you start building your list, the faster it will happen. Get started today! Just think about how many opt-ins you will lose by not acting right now. A journey of 1,000 miles starts with the first step. Take that step right now and you will instantly become motivated. It feels amazing. PS: This isn't a decision you should think about. You get everything, for nothing! Where else in life do you get a proposition like that? The only way to lose is to not join. By joining, you set course for a new, easier life with absolutely zero risk. PPS: Don't wait to join. Each day you delay is delaying you from achieving your dreams. If you think a day or two isn't a big deal, tell me that again when your alarm goes off so you can go to your job. It does matter! Join the winning team NOW. © 2015 Instant Squeeze Page Generator. All rights reserved.